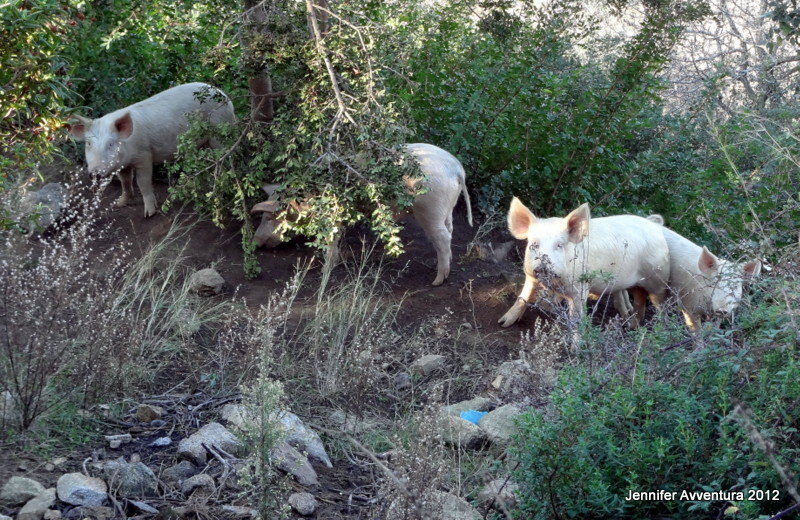 Look what I found on my early morning walk through the Sardinian mountains. Yummy. I love bacon! But they look so cute, I don’t think I could eat them! You see pigs when you are out walking, and I see sheep and deer when out walking. You know you’re not in Kansas anymore!!!! You were brave to take time and snap the shot….did they follow you? Wow, I thought they were wild pigs until I read your comment above! How funny! Did you start laughing when you saw them? I did have a good laugh, until I thought that they thought I was food. They were eager to climb over a little stone fence to me! I walked away rather fast. They are not wild pigs are they? No, they are not wild pigs. However, I would like to think they are. They live on a huge farm near the road I go walking on. The angle which I took the pic makes them look wild. We do however have plenty of wild wild boar around these areas.